Every seat is fitted with a head restraint. The L-shaped head restraints are each only designed for their respective seat. For this reason, do not install head restraints anywhere else. Push the head restraint all the way up . Pull the head restraint out fully while pressing the button . 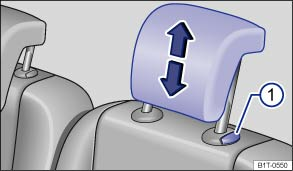 Position the head restraint correctly over the head restraint guides and then insert in the guides of the corresponding seat backrest. Press and hold the button and push down the head restraint. Adjust the head restraint so a correct sitting position can be assumed . Fold the backrest of the rear seat forward . Push back the rear seat backrest and allow to engage securely. Head restraints that have been removed should be fitted as soon as possible so that passengers have correct protection. When removing or fitting head restraints, make sure that they do not hit the roof, the front seat backrest or other vehicle parts. This will prevent damage from occurring. 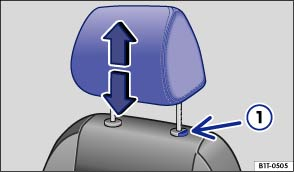 Only fold the backrest of the third row of seats with built-in head restraints forward when the seats of the second row of seats have been pushed so far forward that the head restraints of the third row of seats will not not come into contact with the backrests when they are folded forward. The backrests of the second row of seats could otherwise be damaged.